Shockwave Therapy is now available at The Kelowna Chiropractic Centre. After years of out sourcing and seeing very good results, we felt this is a service worth incorporating at our clinic. Extracorporeal Shockwave Therapy is a series of high-energy percussions to the affected area. The shockwave is a physical sound wave “shock”, not an electric one. 1) Treatment produces an inflammatory response. The body responds by increasing metabolic activity around the site of pain. This stimulates and accelerates the healing process (promotes the remodeling of dysfunctional collagenous tissues, such as tendinopathies, trigger points, muscle strains, etc.). This therapy stimulates the body’s natural self-healing process. There is actually an immediate reduction of pain and improved range of motion. ESWT may also eliminate your need for surgery. Approximately 2000 shocks are administered per treatment area (the duration of which is approximately 5 minutes). Some patients and/or conditions require more shocks and duration, depending on severity and chronicity (how long the condition or injury has existed). Typical treatments cost $90. A series of treatments may be offered at a discounted rate. Normally 3-5 treatments are necessary at weekly intervals; there is a small possibility that 2 or more additional treatments may be necessary if your condition is very chronic. Should you not respond in this time, your case will be reviewed with the doctor to determine an appropriate referral. Success rates with ESWT are unparalleled (over 80-90% improvement). It is a short treatment (usually five to twenty minutes) that may be fairly uncomfortable. However, most people are able to easily tolerate it. However, if you cannot tolerate it, adjustments on the machine can decrease the pressure you feel. There may or may not be immediate pain, but some discomfort may be experienced 2-4 hours after the treatment. In some cases it can last up to 48 hours and in very rare cases, the pain lasted up to 5 days. Some bruising and swelling can occur. 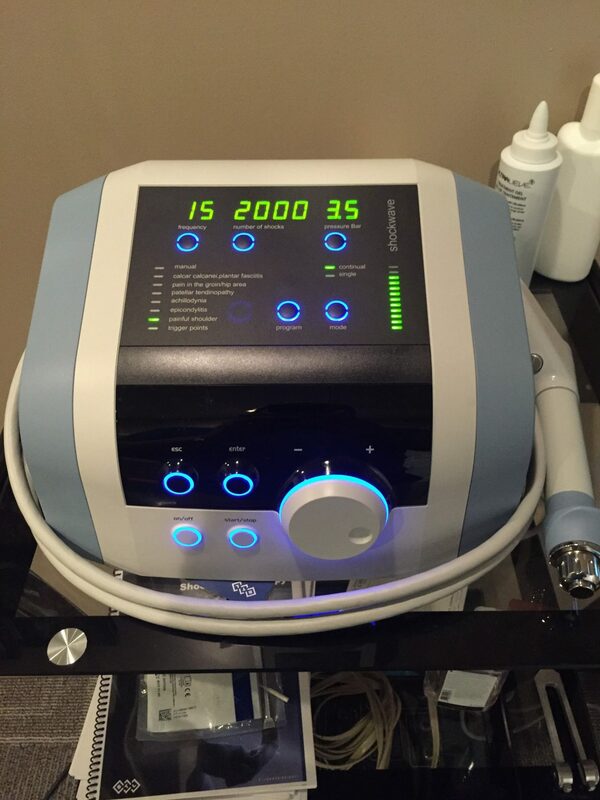 The shockwave will trigger an inflammatory response, which is the body’s natural process of healing. For this reason, do not use anti-inflammatory medications. Do not use ice. The pain should subside within 24 hours. Use Tylenol if necessary, provided you have no trouble with this medication. If you have insurance you will want to ask your provider about the requirements of your coverage. You will be invoiced under Chiropractic/Extracorporeal Shockwave Therapy for treatment. A successful treatment is considered as a patient having at least 75% reduction in pain within 3 months. Worldwide, research based evidence success rates range from 75-85%. Although the short-term effects alone are exceptional, the long-term benefits of this treatment may take up to 3-4 months. If after this time there has not been any marked improvement, you should see your doctor for further treatment options. These can be discussed with Dr. Boruta prior to treatment. ** If you have any questions regarding Shockwave Therapy feel free to visit our clinic, The Kelowna Chiropractic Centre or call Dr. John Boruta at 250-868-0974.